Preservation Hall Shares New Orleans All Over Whether outdoors in New York with the Preservation Hall Jazz Band or inside Orchestra Hall in Chicago at the Big River Concert, the Crescent City ambassadors keep the city's beat alive. With a banjo player in both camps, this show is divided between traditional and modern music. Preservation Hall on St. Peter Street in New Orleans' French Quarter is a musical sanctuary with a mission — "to nurture and perpetuate the art form of New Orleans jazz." The members of the original 1963 Preservation Hall Jazz Band traced their roots directly to individuals who invented that art. 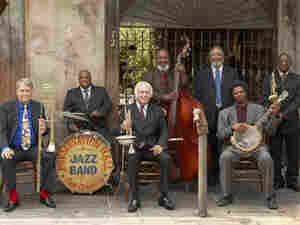 With rolling personnel changes over the course of four decades, the Preservation Hall Jazz Band stays the course. After Hurricane Katrina, Preservation Hall itself remained closed until April 2006, so the band was more active than ever on the road. It came to New York in June 2006 to open the JVC Jazz Festival. Under a big tent at the mayor's mansion, the group played and danced through the crowd. Carl LeBlanc is the first of two banjo celebrities in this edition of JazzSet. Walter Payton is the bassist in Preservation Hall; his son Nicholas is the trumpeter at the Big River Concert, our second stop. In September 2006, at the Chicago Symphony Center, another group of New Orleans players gathered for the second annual Big River Concert. Hugs in the dressing rooms spilled onto the stage and wrapped the audience in a mutual embrace with a beat. Pianist Peter Martin was the concert organizer. First up is Don Vappie — a banjo picker, singer, and purveyor of Creole Culture — with Jeremy Davenport on trumpet. Then pianist Ellis Marsalis takes the spotlight for a waltz. Nicholas Payton and reedman Victor Goines enter next, with Reginald Veal and Herlin Riley remaining constant on bass and drums. Thanks to Jim Fahey, director of programming, and the staff and crew at the Chicago Symphony Center. Our team is technical director Duke Markos, recording engineer Ginger Bruner, technical assistant Yujin Cha, producer Becca Pulliam, and executive producer Thurston Briscoe III at WBGO Jazz 88 in Newark, N.J., and WBGO.org.